On Friday, state legislators in the Michigan House of Representatives made a momentous decision to approve a regional transit system for metro Detroit. That event, preceded by Senate approval, was the culmination of 40 years of struggle to build a unified transit system for Detroit and its suburbs. It sets the stage for the merger of the region’s SMART buses, serving the suburbs, and DDOT, the transit provider for the city of Detroit — which should reduce the notorious delays and unreliability for everyone in the region who depends on transit. But the news is even bigger than that. Approval of the regional transit authority for southeast Michigan will open the door to $25 million in promised federal funds to support either light rail or bus rapid transit on the Woodward Corridor through trendy Midtown. It also paves the way for a system of rapid buses running between destinations in the suburbs. That would allow metro Detroit to quickly make up for a lot of lost ground on transit. And the region finally seems ready. Though Detroit’s faith-based organizations and social justice advocates were an indispensable part of the winning coalition, centrist and even conservative actors like Republican Governor Rick Snyder and the Michigan Suburbs Alliance were just as vocal in their support. And when the Michigan House of Representatives issued its historic vote late last week, it was Republicans — not Democrats — who led the charge. Granted, that was mostly due to the fact that the issue became entangled with Right to Work legislation moving through the statehouse at the same time. But nevertheless, it was telling that Republicans in the statehouse were supportive enough to push the legislation forward, even with anemic Democratic support. 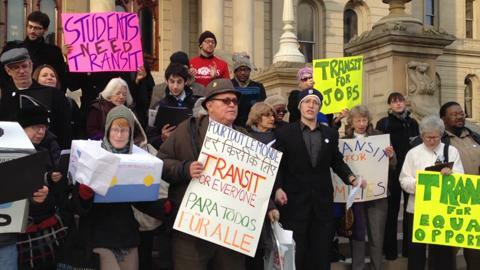 Public opinion on the subject of transit in the Motor City region has evolved dramatically in recent years. If the “old school” perspective on transit had a face, it would be that of Janice Daniels, a Tea Party insurgent elected mayor in the large, affluent suburb of Troy, Michigan, last year. As mayor, Daniels led a campaign to refuse $8.5 million in federal funds to build a transit center in the suburb. Her effort played on the racial fears that have prevented the region’s urban areas and suburbs from cooperating on a transit system for decades. At one City Council meeting on the subject, she hosted an “expert” who argued that the train station would serve as a “mugger hugger” and a “heroin express,” presumably from the city of Detroit. But Daniels’ campaign was headed off by a coalition of transit supporters — most notably the Troy Chamber of Commerce, which reported immediate “fallout” from local businesses to Daniels’ campaign. Auto parts maker Magna International, which employs 1,000 people in the city, threatened to cease hiring or move operations elsewhere. The coalition was able to overpower the mayor and preserve a smaller share of the federal money. The train station Daniels crusaded against is now served by newly improved Amtrak service that travels as fast as 85 miles per hour between Detroit and Chicago. Meanwhile, Daniels — whose homophobic views had also been a rod for criticism — was recalled in a special election in November. Governor Snyder is expected to sign the legislation tomorrow. If they want a serious bus-based rapid transit system, like they have in Bogota, putting it in a street won’t do it. Nor will putting light rail on the street, at least once an area becomes popular enough to attract motor vehicles to get in the way. They have to repurpose some of those expressways within Detroit city boundaries. There must be massive excess capacity, give the loss of jobs and population in the city. Some of the expressways could become joint local/express busways/bikeways. Some road improvements would probably have to be made to connect the other expressways in a way that worked given he ones removed.Grade separated rail could eventually replace the busways then the demand gets high enough, but in the mean time you’d have a quick and cheap core of a system, with perhaps specially made articulated buses to run on it and stations. Good analysis – there has certainly been a growing business understanding of transit – but a couple clarifications are in order. First, the regional transit authority wouldn’t merge the DDOT and SMART bus systems – a legacy of the failed ’70s attempt to establish a unified Southeast Michigan Transportation Authority (SEMTA). As in Chicago, the authority would be an umbrella organization overseeing the existing city and suburban local transit systems, which would endure as separate entities; it would also construct and operate new regional transit lines, after the fashion of Chicago’s Metra. Just as they were in the ’70s, DDOT’s legacy costs are a hot potato. To win suburban support, the legislation requires a unanimous vote of the RTA board to take over any existing transit system. By running rapid transit on key routes, the RTA could allow DDOT and SMART to repurpose more of their service towards local routes; however, DDOT especially remains vulnerable to cuts, since it’s paid for by the City’s general fund. Second, the $25 million from Secretary LaHood was promised specifically to M1 Rail, the privately-funded downtown-to-Midtown streetcar initiative. The region really owes the Secretary for making that money contingent on the establishment of a regional transit authority. In the early ’80s, downtown investors won federal money for a downtown People Mover system of questionable stand-alone utility, even though regional transit efforts had collapsed amidst city-suburb battles. However, a new rapid transit alternatives analysis study for Woodward Avenue, from Detroit through Oakland County all the way to Pontiac, is already underway. The RTA is definitely a big step forward, but we still have a way to go to reach our end, or even the end of the beginning. Ah its finally great to hear mainstream Republicans backing transit! Enough of these tea party hijackers! Now I wont to have to feel some sort of guilt being a Libertarian that supports mass transit lmao.